With eye-wateringly early starts and raucous receptions that continue well into the early hours, the average big fat Asian wedding is a test of sheer stamina for most adults - so imagine the toll it can take on your younger guests! 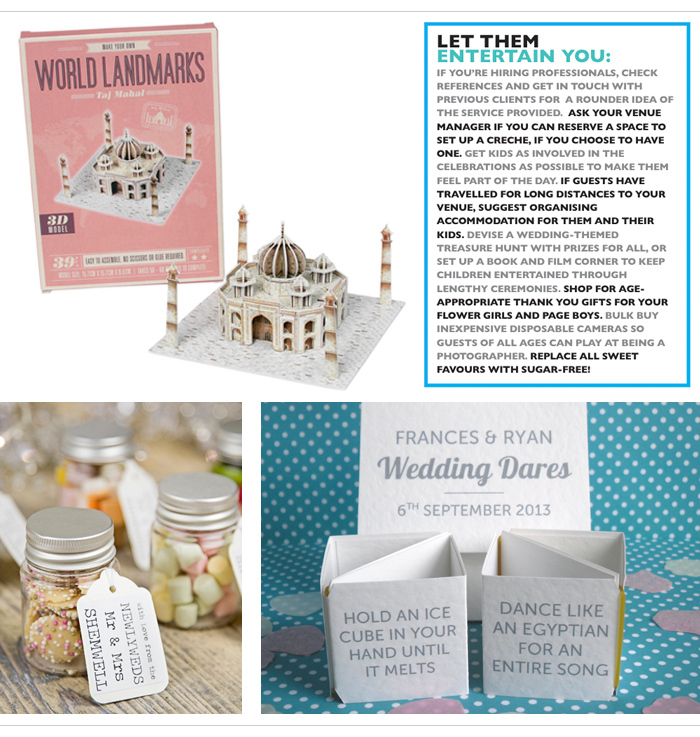 Our quick guide shows you how to keep them amused throughout your nuptials, whatever the age group. With Asian families being as extensive as they are, you’ll probably have at least a few tiny tots at your wedding. Consider setting up a mini crèche in a room at the venue to give their parents a chance to celebrate with you rather than running after their fidgety offspring. Staffed by highly qualified childcare professionals, Tinies Mobile Crèche cater to events nationwide. Remember those birthday parties in primary school where, once you’d had your fill of cake and Pass the Parcel, you’d leave with a bag full of unknown treasures? Recreate this with trinkets, toys, puzzles and a personalised activity book for the children. It needn’t be expensive - download a free activity book on LovelyIndeed.com or buy one at YoYoMe.co.uk, and head to your local poundshop for inspiration. A great option for kids aged 11-14 is a photo booth, complete with wedding-inspired props and accessories. Not only will it help break the ice, but you’ll end up with great shots of all the kids together. Or keep them sweet with a healthy dessert bar, loaded with fruit, nuts and low-fat sorbet to keep their sugar levels in check. The chances are that this age group (15-18) will be glued to their smartphones throughout the celebrations, so why not set up a Twitter hashtag, Pinterest board or Instagram account allowing them to document your Big Day in real-time through social media? It’ll make them feel part of the day and keep those who couldn’t make it to your wedding updated, wherever they are in the world. Or alternatively, have them download a wedding photo and videosharing app to collect everything in one place. Apps like WedPics will work perfectly.